A raspberry-red grossular from the Sierra de Cruces Range in the state of Coahuila in Mexico has been investigated. 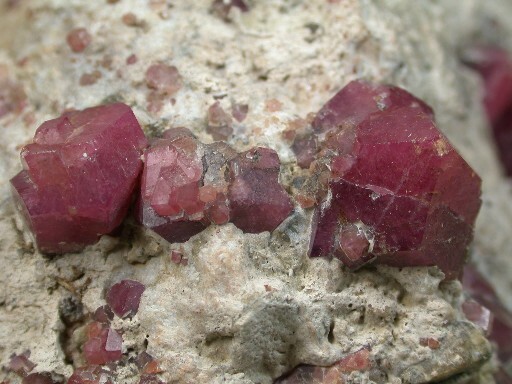 Electron-microprobe analysis and 57Fe Mößbauer and UV/VIS spectroscopy were used in order to investigate the nature of the unusual red colour. The composition of the garnet is approximately (Ca2.94Mg0.08Mn 2+0.13)3.12 (Al1.90Fe3+ 0.05Mn3+0.01)1.96 Si2.97 O12. The UV/VIS spectrum is characterised by an absorption envelope centred around 19,000 cm-1 in the green region, which can be fit to two bands located at 19,503 and 17,302 cm-1, originating from two spin-allowed dd-electron transitions. They result from the presence of Mn3+ on the octahedral site of point symmetry bar-3.